Germany has the largest population in Europe. They also have one of the most established medicinal cannabis markets. As we’ve seen in the U.S. and Canada, recreational legislation often follows not far behind medicinal. 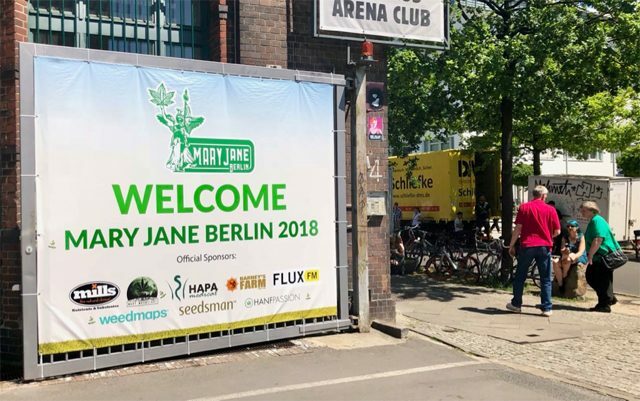 I went to Mary Jane Berlin to find out what’s going in the the German recreational cannabis market and where the opportunities lie. Growing cannabis in Germany is illegal without a permit. Currently, you can only get a permit to grow for the medical market. The German medical cannabis market is not like the U.S. model. Dried flowers are treated to the same level of standards as other medicines that are distributed through pharmacies. This ensures that medical users who get a prescription from their doctor get safe and consistent medicine. Unfortunately, a pharmaceutical approach to cultivation, processing and distribution leaves cannabis connoisseurs (or recreational users) unsatisfied. Per gram, the product is expensive and it does not offer the smells, tastes and effects that they can enjoy from cannabis currently produced through illicit channels. Officially, there is no German recreational market. No one can grow it so the raw product – THC rich cannabis – is outlawed. The selling of cannabis seeds or clones is prohibited, though both are easily available online from other EU member states that tolerate their sale. It seems logical that will change one day. 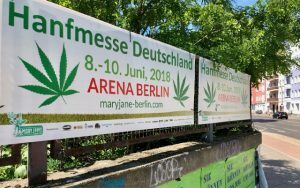 In the meantime, the German recreational consumers rely on discretion (on their behalf) and tolerance (from the authorities). The tolerance part depends on where you live. Berlin and other northern areas are more liberal than say, Bavaria – a place where many Germans would not risk carrying small amounts of cannabis on them – let alone growing the stuff. I was staying in a hip neighbourhood a couple of train stops away from the Mary Jane Berlin event. Unlike other European cities, there was no overt signs of cannabis use or activism. In London, Paris, Brussels or Barcelona you don’t need to be there long to smell cannabis or see calls to “Free the Weed” in graffiti or street stickers. In Berlin, I had a different impression. It was clear that people consume it, but they do it discreetly in their own homes. People don’t seem to complain about not having access to cannabis; they are just getting on with it, enjoying the cannabis lifestyle and not drawing attention to themselves. This means that cannabis is either coming via the streets or through small circles of friends. The latter is interesting as this creates a market around supplying the small time growers with what they need. Grow tents, nutrients, lights, pot systems and processing equipment are all required, and selling these are not illegal. It is perfectly legal to sell a tent to grow herbs or vegetables in your apartment. Again, discretion is key. These products may not be specifically marketed towards cannabis growers, but the growers know what they need to buy. 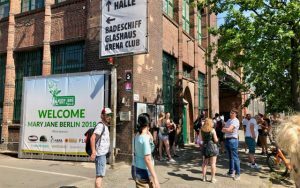 After my three days attending Mary Jane Berlin, I was left with the impression that the cannabis lifestyle was one of the key elements surrounding the recreational market. The queues to the event were huge and people were soaking up the great vibes. I had the occasional whiff of cannabis smoke, but it was nothing compared to other cannabis events I have attended in the past. It seems that a lot of people were simply there to live the cannabis lifestyle. This is something that the companies such as Weedmaps are plugging into. They create this vibe and lifestyle around cannabis; chilling with friends, enjoying life, fostering a caring community spirit, tolerance, inclusion and even a bit of surfing. If they sell a few caps or t-shirts along the way, then that works twofold – it gives them more guerrilla marketing exposure (for the day recreational cannabis is legal) and also turns a profit. Everyone has their preferred method of consumption and all these are catered to in the German market; bongs, pipes, joints and vaporizers. Aside the established players in the paraphernalia market, such as EHLE or ROOR, newer companies are getting a foothold. Storz and Bickel are a German vaporizer company. The vaporizer market is really heating up and becoming quite a fascinating thing. I liken it to car manufacturers. Brands are emerging with a stable of vapes meeting certain market segments. A car manufacturer will offer a hatchback, SUV, minivan etc. A good vaporizer brand will offer multiple product lines of vapes – pen vapes for concentrates, pocket vapes for flowers, big ones for home use, stealth devices for parties. Over time they incrementally improve their offering in each of these sub segments just like car makers do. They are building vaporizers, but they are also building brand loyalty and the whole ethos surrounding that – which is where we get right back to the cannabis lifestyle again. If the vaporizer companies are the cars, then who’s going to make the fuel? Currently (& legally), no-one is allowed to produce the fuel for the German recreational cannabis lifestyle – the cannabis itself. The small time producers, I discussed already, but the potential for the big guys is massive. For the moment, it’s time to lay the groundwork and build brand awareness. CBD products are legal in Germany as long as they contain no more than 0.2% THC. This offers an opportunity to a new wave of urban farmers producing CBD rich strains. In Italy, they refer to it as “Cannabis Lite”. It’s easy to buy anywhere you can buy tobacco. In Switzerland, they even sell it in supermarkets. Now these brands are entering the German market. Most of the representatives for these companies don’t like CBD rich strains being referred to as “Cannabis Lite”. It’s not like low alcohol beer, or decaffeinated coffee. The plant has a whole array of useful cannabinoids and we only understand a few of them. THC is special in that it is psychotropic and therefore controlled. A flower that has little THC but a lot of other good therapeutic components does not make it “Cannabis Lite”. It is still cannabis after all – maybe “THC lite”, but 0.2% is so light that it’s hardly worth the mention. In the current legal climate, focusing on the THC content is probably not a wise track to take. Presently, they offer strains high in CBD. But as laws change, that could easily change too. Imagine you are currently buying your CBD rich strain from a company you trust. Once the laws are relaxed and they start to offer a 10% THC product, there’s a good chance you’ll stick to your trusted brand – rather like cigarette companies used to be allowed to promote the lifestyle around their brand. I know people are going to say “but what about home growers?”. We don’t want Big Canna producing our cannabis and distributing it through supermarkets and tobacconists. Do we? I’ve dreamt of the day I could buy weed as easily as I can buy beer. I’m happy for there to be a Big Cannabis as long as we tolerate thousands of little cannabis farmers and let the consumers decide. 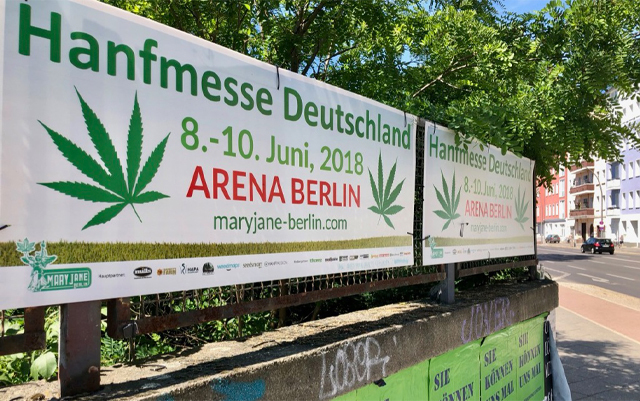 I have no idea how things will pan out in Germany with regards to who will be allowed to produce for the recreational market. I sincerely hope that when this happens, home growers are allowed to participate too. I grow for myself for two reasons: Necessity, and as a hobby I love. It’s not always easy to maintain a steady flow of cannabis for personal use. If I could pop to a shop and buy some nice artisanal organically produced cannabis flowers there is a good chance I would. Personally, I doubt that I would buy strains sealed in a plastic bag from my supermarket, but others would – and why not? After all, it’s safer than a can of beer. 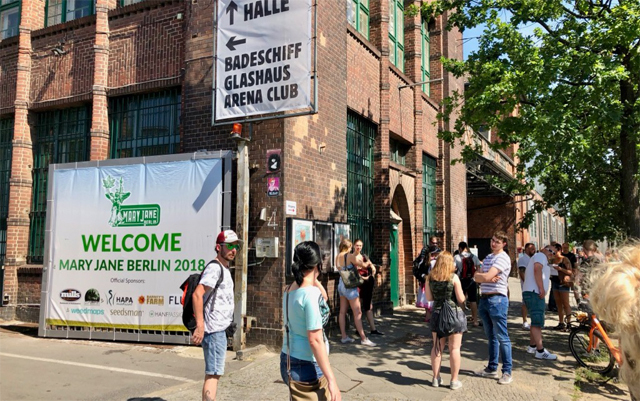 Everyone I spoke to, and myself included, hopes that when Germany starts to create and enforce laws around the recreational cannabis lifestyle, they do so in a way that tolerates the small growers as well as making great opportunities for the big players.